NEW ALBANY, Ind. 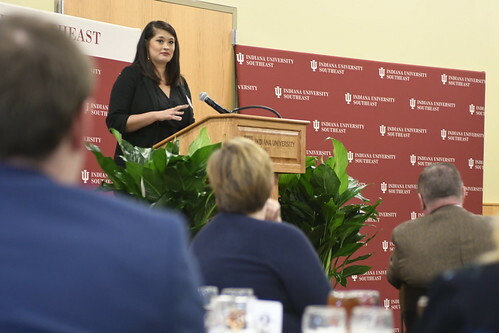 — Indiana University Southeast celebrated its scholarship recipients and the donors that made those gifts possible at the annual Scholarship Luncheon on Sunday, Nov. 5. Nearly 200 scholarship recipients and supporters shared stories and successes over lunch in the Hoosier Room. Student speakers Jonathan Grimes, Cassy Goodridge and Rebekah Raisor stories of how receiving scholarships have helped them pursue their dreams. School of Business Dean David Eplion was the keynote speaker and shared stories not only of the good he’s seen from scholarships on this campus but also how scholarships have personally impacted his family. To see a full list of scholarships IU Southeast offers, visit ius.edu/scholarships.